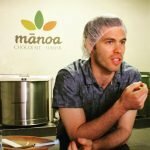 Manoa Chocolate Hawaii craft high quality chocolate using sustainable techniques. As well as sourcing quality beans from around the world, they also use cacao grown in Hawaii. Hawaii is the only US state to grow cacao, and the deep flavours reflect the special characteristics of the geography and climate in which it is grown. Manoa improve the profit potential of local farmers and provide opportunities for employment in the local community. They have created some amazing machines from recycled items – they roast using a custom bbq and remove the cacao shells with pedal power and a vacuum. If you love wine as much as you love chocolate, check out the Manoa website for a page on how to match each of their bars with the perfect glass of wine!